1. Helps in Weight Management- Eggs are an excellent source of high-quality protein. It contains almost 6g of protein and just 80 calories. The high-quality protein in eggs keeps you full and reduces your hunger pangs, thereby helping you maintain weight. 2. Builds Muscle Strength- The high-quality protein in eggs helps gain muscle strength and reduces muscle loss. 3. Promotes Healthy Pregnancy- Egg yolk is a rich source of the nutrient choline. Choline is an essential nutrient, especially during pregnancy, as it contributes to fetal brain development and prevents birth defects. 4. 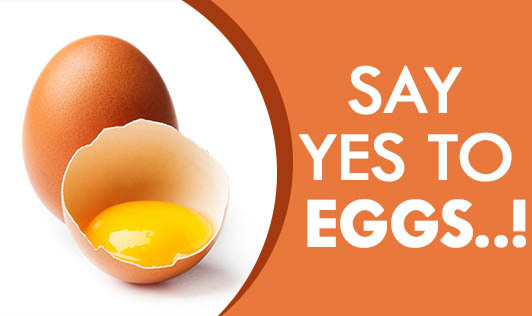 Protects Eye Sight- Egg yolks are a good source of carotenoids like lutein and zeaxanthin, which helps to prevent age-related macular degeneration and cataracts in ageing people. 5. Aids Brain Function- Choline not only maintains the structure of the brain-cell membranes but is also a key component of the neurotransmitters that send messages from the brain to the muscles. Boiled, scrambled, or fried-eggs are worthy of their praise. You can definitely make them a part of your healthy diet.